gardening in the boroughs of nyc: When will I get some lemons? We've had this meyer lemon plant for almost 3 years and it has yet to produce any fruit. The last two years, we kept it near the window sill in our apartment and it probably did not get enough sunlight. So when we moved to a house this year, we finally re-potted it into a large container, added some compost and brought it outdoors to soak up the sun. It loved it. It sprouted new leaves and grew about 4 inches taller! The plant is so much happier. I'm really hoping it will fruit in the near future! Does anyone else have a meyer lemon plant? Do you fertilize it? Any tips on how to get it to fruit would be so appreciated. I was just going to suggest Thomas. He gets tons of lemons from his, and it's only a bit over a year old, I think. He got enough full sized lemons to make a batch of marmalade last winter, and he's in Massachusetts! I though I read somewhere that it depends on age of the wood when the cutting was taken from the mother tree. My meyer lemon produced edible fruit 18 months after I purchased it. 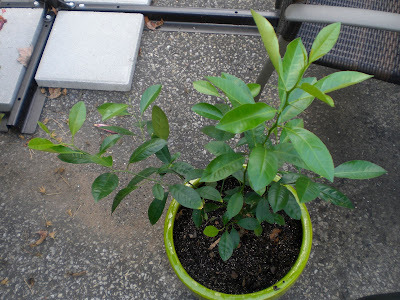 If you click on the "meyer lemon" label on my sidebar, you call read all of my posts regarding my little tree. Also, I would strongly suggest purchasing a slow release citrus fertilizer for your tree. I second kelly & Gran, go look at Thomas's photos and lemon posts, his are doing great! My step-dad put his in the ground and built a green house around it. He keeps it heated in the extreme cold. It grew fast and made lemons after a couple of years.